Blepharoplasty, also known as an eyelid lift, is a common surgery that is performed to remove excess skin on the upper eyelids. In the Asian population, however, this skin has a tendency to fall over the lashes from an earlier age. The main reason for this phenomenon is that Asians lack a well-defined crease in the upper lid or the crease is located in a very low position. These patients experience a sensation of heaviness on their eyelids and may seek help to improve their visual symptoms. Others seek a plastic surgeon because they want to change their appearance. In either case, the surgeon must perform a procedure that meets the needs of each patient. Unlike conventional blepharoplasty, Asian blepharoplasty requires that the surgeon make a new crease in the eyelids, also known as double eyelid surgery. The height of the new crease is determined by the patient with the advice of the surgeon. Some patients desire a high crease, while others prefer a more subtle result. The most important thing is to preserve the Asian “look” of the patient; otherwise, the face adopts an unnatural appearance because the eyes do not harmonize with other facial features, such as the nose and the lips. Asian blepharoplasty is performed on an outpatient basis under local anesthesia or light sedation, depending on the preference of the patient. This means that you can recover at home without the need to be hospitalized. You can expect some degree of inflammation and bruising after the procedure. The vast majority of patients can return to work a week after the procedure. 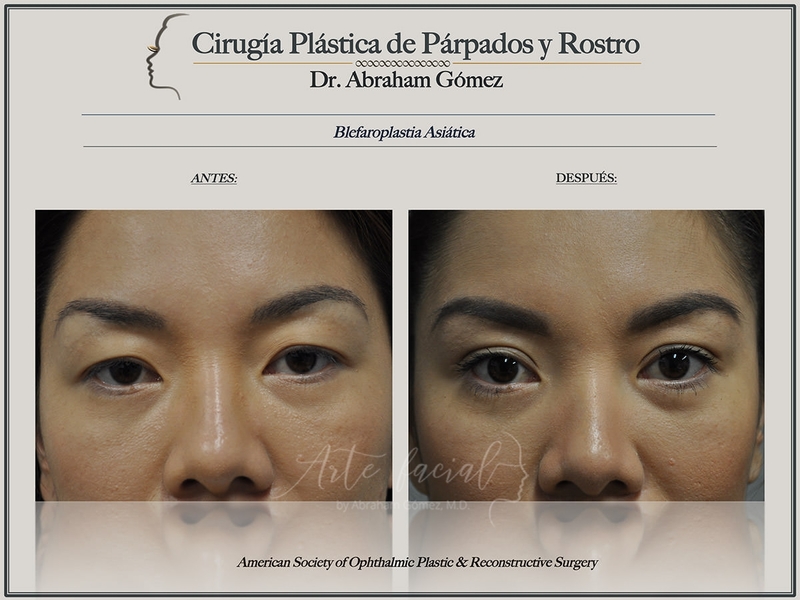 It is extremely important that you follow your surgeon’s instructions to achieve the best result (see patient form “Asian blepharoplasty”). The new crease will appear higher than you expect for the first few weeks after the surgery. As the weeks pass, the eyelid contour will look natural and attractive. Eyelid surgery in Asians requires a detailed knowledge of the anatomical structures that make up this delicate tissue. Oculoplastic surgeons have been trained to perform Asian blepharoplasties safely, using advanced microsurgical techniques. This is fundamental to achieve the result that meets your expectations.